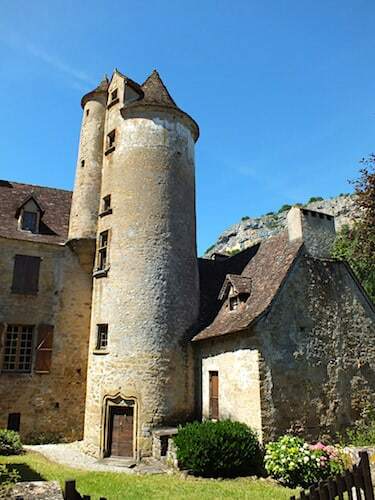 The Chateau de Limargue is a stone's throw from the Gouffre de Padirac. This natural cirque formed by two 150m high cliffs received the label Espace Naturel Sensible in 2009. The regional council thus invested in protecting the site and the cliff top is now only accessible on foot. The imposing manor house was built in the late 15th century at the foot of the cliffs, on the south side of the village. The story goes that Charles VIII rewarded a certain Lafon, commoner by birth, for his bravery and temerity during the Italian military campaigns by making him a knight. The king granted him also the privilege of building towers and machicolation, a right then reserved to the nobility. The knight of Lafon also chose a star (probably as his lucky star) for his coat-of-arms, which he had engraved on the stair tower. 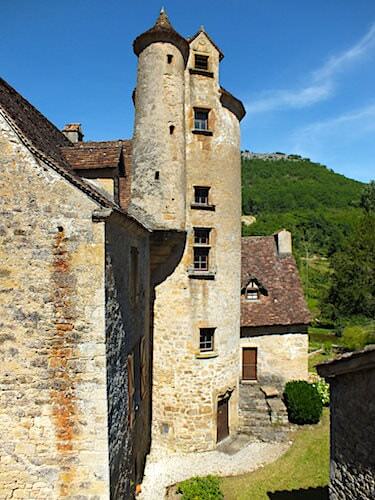 The Chateau de Limargue was classified historical monument in 1929 and is privately owned. It forms an impressive architectural ensemble that includes beautiful old roofs with dormer windows. However, the two architectural elements that stand out are the stair-tower and the round defense tower. The stair-tower marks the corner of the main building and the wing. 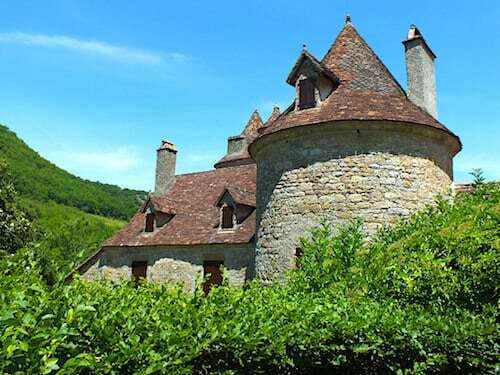 It boasts a stunning corbelled turret crowned with a pointed roof that led to the dovecote, which is practically in its original state. The manor house has also retained its massive round defense tower, but not its machicolations, which were alas destroyed when the main building was altered in the 18th and 19th centuries. 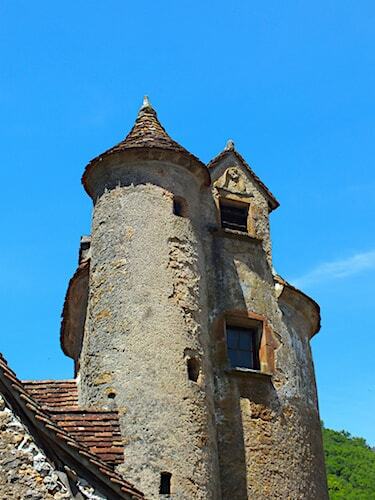 This picturesque village on the edge of the Causse de Gramat boasts a remarkable architectural heritage. This earned it to be ranked among the most beautiful villages in France, but also to be nicknamed Little Versailles. 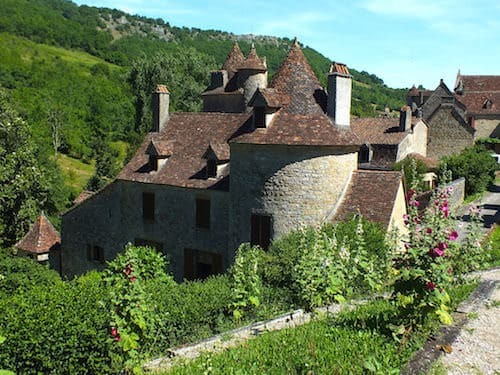 It indeed boasts superb mansions, many classified historical monuments; Manor of Laroque-Delparat, Chateau de Busquelles, Chateau de la Roque-Maynard and Manoir Colomb. It also has a rich religious architectural heritage with the chapelle Saint-Roch and the Romanesque Eglise Saint-Pierre-et-Saint-Paul. That said, its village houses are equally stunning and are a perfect illustration of Quercy architecture, one of the finest in France! Autoire's strategic location has been known for centuries as its name comes from the Celtic altus and duros which meant stronghold. 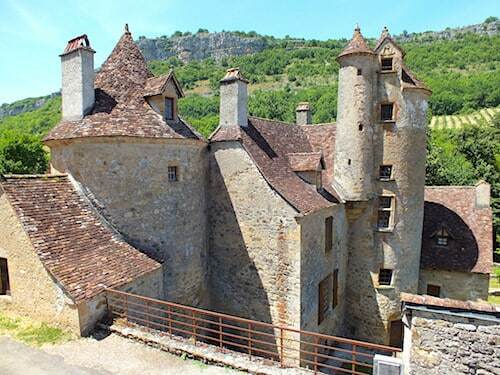 For generations, villagers lived in the troglodyte dwellings of the cliff, but in the late 12th century, the lord of Autoire built La Roque d'Autoire. The listed ruins of the troglodyte fortress, commonly known as Chateau des Anglais, still overlook the village.